We are still a long way from a cure for ALS -- or even finding what causes the brutal disease. But this year a group of patients and athletes brought us a little closer. For that reason, Pete Frates and Steve Gleason were honored as Sports Illustrated's Inspiration of the Year for their efforts in the fight to defeat ALS. Two years before America met Pete Frates, he was fighting. No, he was on a crusade. It was 2012 when the former captain of Boston College’s baseball team was diagnosed with amyotrophic lateral sclerosis. ALS had always been linked Lou Gehrig’s famous “luckiest man” speech in 1939, but there was still no cure or even any known causes. Frates would soon be robbed of his ability to talk, walk and swallow food. He and his family wanted to know why. They went to closed-door board rooms and sat through rubber-chicken banquets. They lobbied the Federal Drug Administration and CEO’s of drug companies. The Frates plead to everyone and anyone who might help, but each venture yielded increasing frustration. Audiences shed tears and wrote checks, but sustaining momentum was a constant struggle. But for two years, Frates continued to fight. He wouldn’t give up -- he couldn’t give up. Frates always prided himself on his strong hands, the ones that held a firm grip on his bat, the ones that powered base hits through the gap. Though those hands began to tremble, and no longer worked in perfect concert with his eyes or brain, Frates never relented. He mounted a poster of Lou Gehrig’s speech on the wall of his garage. It inspired him every day. I may have had a tough break, but I have an awful lot to live for. The quote became his mantra. Then, one day last July, Frates posted a 52-second video to Facebook. He challenged friends and a few people in the Boston sports community to try this thing called the “Ice Bucket Challenge.” It was passed along from Pat Quinn, 31, an ALS patient from New York, who had seen it on Facebook. The challenge started without a specific charity in mind and the mechanics were simple: Dump a bucket of ice over your head, post it to social media, then nominate others to either do the same within 24 hours or make a donation. Frates dared a handful of people to join his fight against ALS. They did, and millions of others followed. Those who doubted Frates for so long underestimated the collective reach of the sports community in the digital age. About a week later, a cultural phenomenon was sparked, and America was introduced to Pete Frates. ​Frates is a 2014 recipient of the Sports Illustration Inspiration Award not only because he became the face of the Ice Bucket Challenge. Rather, the 29-year-old from Massachusetts, like fellow SI Inspiration Award recipient Steve Gleason, persevered for a cause that for so long was neglected by the public at large. There are an estimated 30,000 Americans living with ALS, and patients are given two to five years to live after diagnosis. Though it took a viral campaign for America to fully appreciate the tireless perseverance of Gleason and Frates, those efforts are not forgotten. Gallons upon of ice water just fortified their fight. We are still a long way from a cure from ALS, but one day we will find it. At first, Frates’ friends and family took part in the Ice Bucket Challenge. Then it reached Patriots wide receiver Julian Edelman and several members of the Boston Bruins. Soon after, Jeter and Jordan filmed videos. Entire college football teams got sprayed by hoses; LeBron James was doused on a yacht; Roger Goodell in his driveway; Paul Bissonnette, the pro hockey player, had a helicopter dump water on him as he stood on a mountaintop overlooking Lake Widgeon in British Columbia. Even Bill Belichick found reason to shed his beloved hoodie. And then came the non-sports celebrities: the Kennedy family, George Bush, Taylor Swift, Steven Spielberg. Justin Bieber did it twice (once with a shirt, once without). 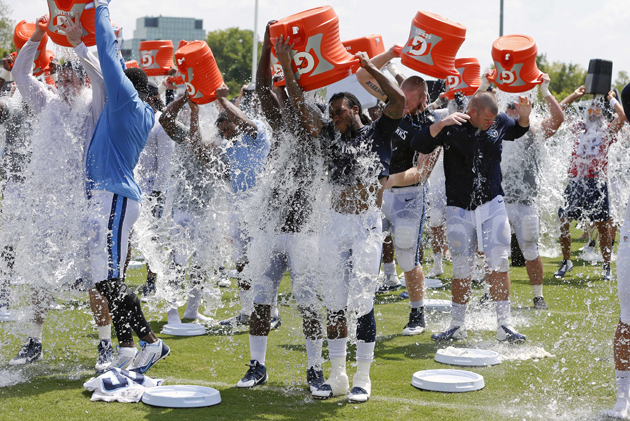 In the age of 140-character tweets, the Ice Bucket Challenge had miraculous staying power. The momentum, finally, seemed unstoppable. The ALS Association reported more than $100 million in donations from July 29 to Aug 29, a staggering uptick compared to $2.8 million during the same time span in the previous year. In 2013, the ALSA national office received $128,000 in online donations; so far, in ’14, it has reaped $96 million. “To raise this much money in such a short time is absolutely astounding,” says ALSA spokesperson Brian Frederick. Because the Ice Bucket Challenge was simplistic and fun, some critics slapped it with a “slactivisim” tag. As countless people shared videos of themselves showing off their summer bodies and shrieking at the bone-chilling cold water, it was easy to wonder if they knew exactly why they were participating. For decades, ALS advocates had difficulty raising research money because the rare disease is complex to explain—and because the outlook is so bleak. There are no survivors. When patients are diagnosed, they’re told they likely have two to five years left to live. And they’re not good years. 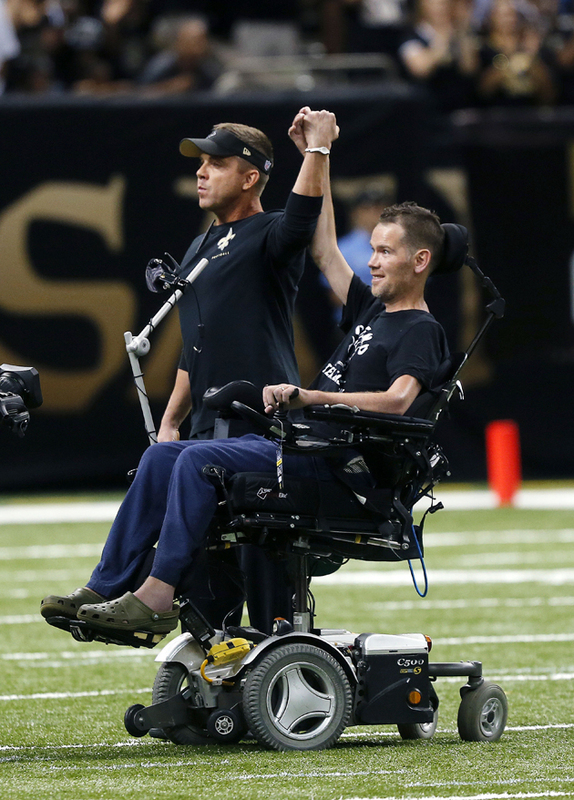 Gleason, a fan-favorite when he blocked a punt in New Orleans’ first home game following Hurricane Katrina, has only amplified his life mantra, “No White Flags.” He’s skydived; he’s trekked up Machu Picchu with the help of friends; he’s spoken one-on-one with Bill Gates about combatting his disease. He has also privately gathered funds and partnered with neuroscientists, researchers, academics and pharmaceutical companies to help develop one of the most ambitious initiatives in the history of ALS research. He has been a mentor, and also a friend to Frates, their bond as former athletes significant as they search for answers. A large number of ALS patients are former athletes, and researchers are looking at possible links to the disease and head trauma. A 2012 research study sponsored by the Centers for Disease Control and Prevention found that deaths from Alzheimer's, Parkinson's and Lou Gehrig's diseases, when combined, occurred in NFL players at about three times the predicted rate for the general population. “We have learned, in the last three to five years, that there is a connection between football and brain disease, including ALS,” says Gleason. “Its not my opinion, or anyone’s question. It’s a fact. I was unknowingly at higher risk,” Gleason is also mindful of the platform he has been given through football, to become an agent for change. 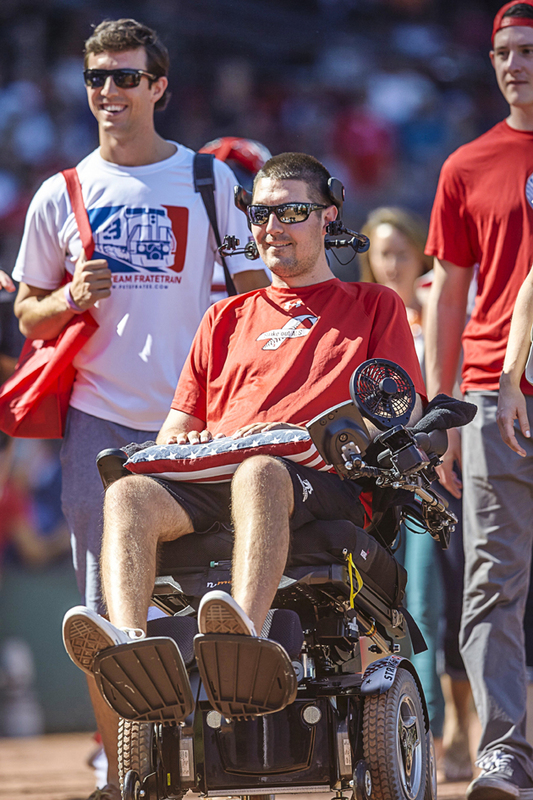 Two years before America met Pete Frates, his family rallied around his cause. “Team FrateTrain” was an in-house initiative. Frates’ uncle built the website. Another uncle handled finances while an aunt handled public relations. Everyone pitched in as caretakers. John Frates, Pete’s father, continually jokes that his 15 minutes of fame are long expired. Except America still wants to listen. The fight is bigger than ever. For more from the Inspirations series of uplifting stories, click here.